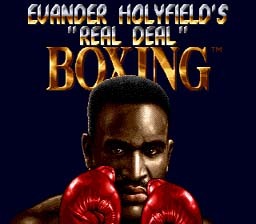 Play Evander Holyfield Real Deal Boxing Now! Pound the stuffing out of your opponent. Take on the computer, tournament style, or fight with a friend. Just keep the fighting in the game, please. This is certainly a great game for boxing fans, and a good game in general really. You have lots of options to tailor your fighter to the style that suits you best. From Right- or Left-Handed, to how much Power, Speed, Stamina, and Defense you want to use. Of course you have different kinds of punches to use during a fight. Just push the punch button to Jab, push forward to Hook, push down to go for the body, and push the punch and block button together for your Uppercut. Body and head damage are tracked separately in this game, so it actually matters where you put in your punches, and some fighters are weaker in the gut or soft in the head (I guess all fighters are soft in the head to some extent). After the fight you get training options, again choose which ones you want based on your priority for improving Power, Speed, Stamina and Defense. When starting a new career, enter your name as THE BEAST. This will start you as a big green boxer with perfect scores in all statistics.